Businesses handle high-value data in their day-to-day operations. Employee and customer information and other business data (financial, suppliers, partners, and possibly business secrets as well) are just some of the valuable data processed every single day. A single cyber attack could compromise some or all of this private information and could bring an organization to its knees. Attacks can even leapfrog to attack business partners the way Target was attacked via its HVAC company. This is one of the many reasons why cybersecurity decisions are especially critical for businesses, regardless of size. 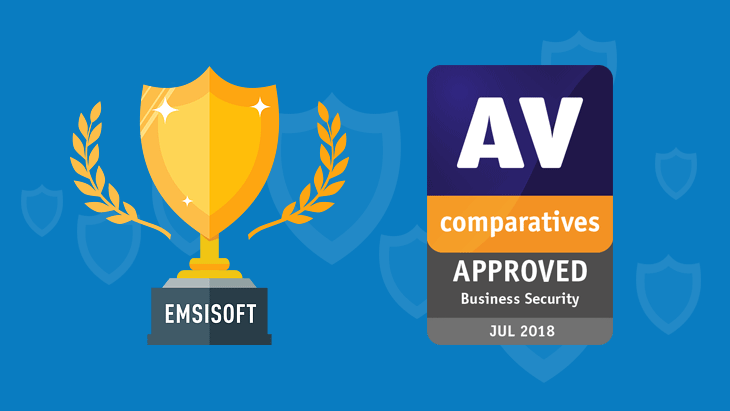 AV-Comparatives, a widely-recognized, independent AV testing organization recently released its biannual Business Security Test Report after evaluating the antivirus and anti-malware capabilities of the most reputable AV companies in the industry, and we are proud to report that Emsisoft Anti-Malware and Enterprise Console passed all the necessary tests and stringent qualifications to receive the coveted Approved Business Product Award. The Business Product Award is based on three tests: Real-World Protection Test, Malware Protection Test, and Performance Test. For this round, AV-Comparatives used test results from March to June 2018. Only products scoring 90% or better across all the tests are awarded the Approved Business Product Award. Malicious attackers are getting more sophisticated by the day. Expertly crafted and exceptionally legitimate-looking email phishing attacks and malicious messages being delivered even in personal social media accounts such as Facebook and LinkedIn are just two of the most common ways Internet users (personal and business) are victimized. With all malware developments coming at rapid speed, it’s hard to keep up with trends and very easy to fall for an attack. However, with Emsisoft’s Surf Protect layer, your time on the web is secure and you can have peace of mind that you and your employees are protected from such exploitation. By using 1163 known malware variants, the Real-World Protection Test simulates how business systems are attacked, mostly by surfing the web and other routine Internet use and behavior. Emsisoft performed exceptionally well with zero false alarms and 99.3% of test cases blocked. There are instances when hackers are targeting a specific company or industry and would use multiple attack vectors to infiltrate an organization. If a company has solid security from attacks coming from the Internet, these hackers might try other tricks such as breaching through a local area network or planting infected devices such as a USB. So what’s a company to do when hackers go the extra mile? The Emsisoft Anti-Malware Real Time File Guard and Behavior Blocker features help ensure that all downloaded and modified files are checked in real time, and brand new threats that aren’t yet known by signatures are continually monitored and raises an alert as soon as something suspicious occurs. The Malware Protection Test considers a scenario in which the malware enters the test system such as the LAN or removable device, rather than from the Internet. Emsisoft performed at an impressive 99.7% malware protection rate, with zero false positives. PC performance should not suffer in the name of cybersecurity. With Emsisoft, you can have your pie and eat it, too. Emsisoft is the only anti-malware solution that utilizes a dual scanner. It not only detects more because it uses the full power of two major antivirus-and anti-malware technologies, it also scans quicker because of the efficient combination of the scanners. Any unnecessary duplicates in detection are avoided, enabling the least impact on memory and overall hardware resources. Using PC Mark 10 Professional Edition as a benchmark, the Performance Test looks at the impact each product has on the system’s performance, including how much it slows down normal use of the PC while performing certain tasks such as browsing websites, downloading files, launching applications, and more. Emsisoft scored incredibly well with a 12-point Impact Score and 98.0 (out of 100) PC Mark Score. A false positive test and user interface review were also considered in the results. 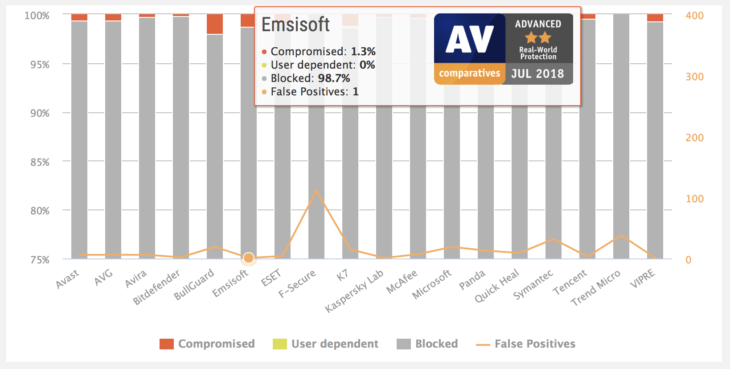 Out of all 16 participants, Emsisoft received one of the lowest false positives. In fact, Emsisoft raised zero false positives in all tests, proving its reliability when catching malware. The newly updated interface, on the other hand, was designed with ease-of-use, intuitiveness, and workflow efficiency in mind. While AV-Comparatives recommends Emsisoft Anti-Malware with Enterprise Console for larger teams, our business clients range from small to large organizations, of diverse industries, including manufacturing and government, and from countries throughout the world. From installation to maintenance, our exceptional Support Team assists customers 24/7, regardless of company size. We are incredibly proud of the quality and service we deliver to our customers. Our mission of a malware-free world drives us forward and we are grateful that you are on this journey with us. AV-Comparatives is an independent organization dedicated to evaluating the effectiveness and efficiency of security software. 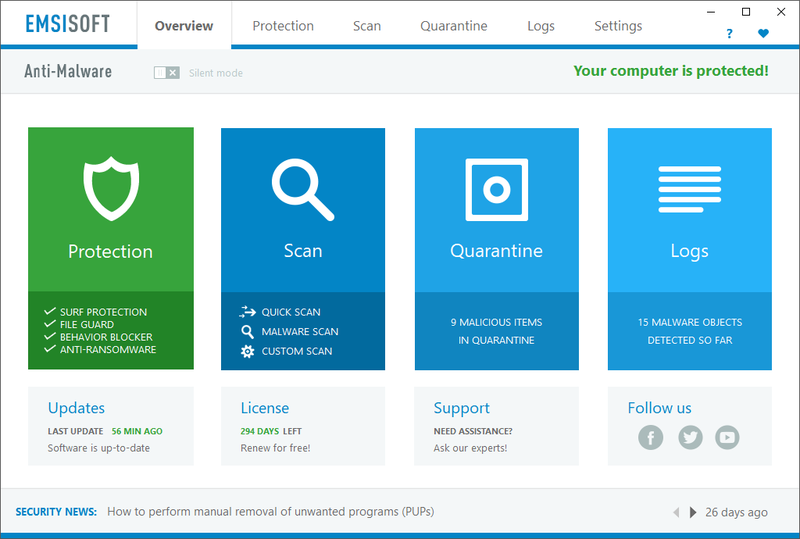 The organization provides reliable testing methodologies and create high-quality reports that deliver deep insight into the capabilities of antivirus products for home and business AV users. 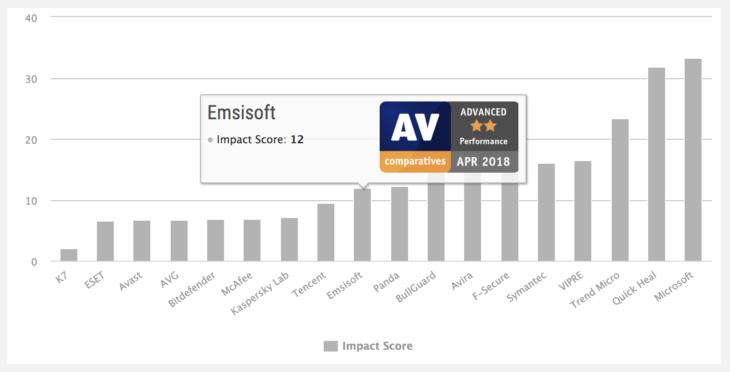 Click here to read the full report of the AV-Comparatives Business Security Test, or check out other awards we’ve received in the past here. Katherine is a NY-based marketer and cybersecurity aficionado.